READY TO DIVE: Giovanni Vidalis at Storebay prepped for an underwater expedition. 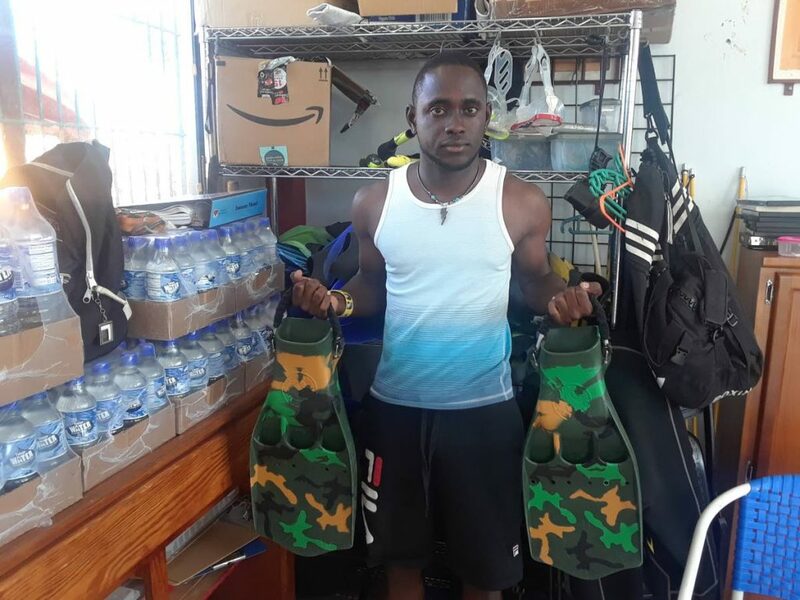 DIVER Giovanni Vidalis, 22, originally from Trinidad, fell in love with Tobago waters and is now enjoying his passion each day. Vidalis can be found almost daily at Frontier Divers in Storebay helping tourists explore the beauty of the water world. He said a visit to the popular beach to relax last November was when a job opportunity came his way. Within one month he moved from Ste Madeleine to French Fort, Scarborough to work. Giovanni Vidalis shows off some of the diving gear at Frontier Divers at Storebay. Vidalis said his parents' effort to alleviate a severe asthma condition was crucial to placing him on the path to his current career. He said he was never excited to learn to swim but was placed in a swimming club as they felt it would help increase his lung capacity and make breathing easier. “I hated it; I thought it was a bad choice my parents made, but then I started to like it. This is when I was sent into competition at the Goodwill Games in Guyana. Even though I started to like swimming, I hated competition,” he said. Vidalis said after leaving secondary school he began to research careers that involve swimming. He began teaching the sport at a number of clubs and would sometimes be hired to act as a lifeguard at private pool parties for children. Vidalis said he now dives at least 14 times a week and has gained a lot of experience in the short time. 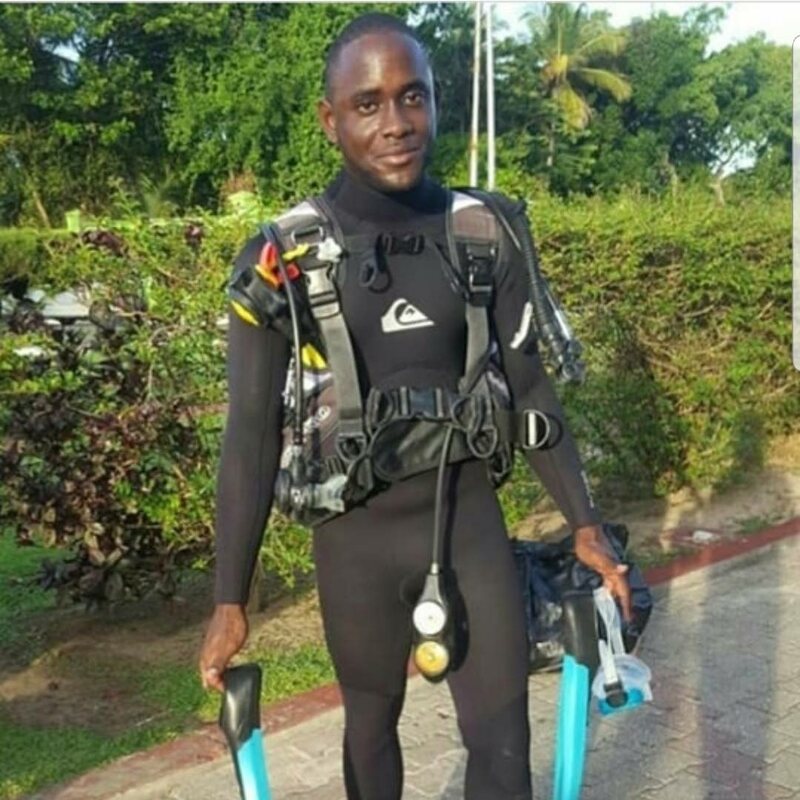 “The more you experience, you won’t panic and will be able to handle situations underwater better,” he said. He described diving as moving into another universe and encouraged young people to try it as a recreation. “We pretty much can access everything that is on land, astronauts even travelled to the moon and found nothing, but it will take a lifetime to completely explore just part of the sea and discover its rare inhabitants,” he said. Reply to "Vidalis’ diving passion"